Not the most flattering picturing- but these are shockingly delicious. Last weekend I picked up Jess P.’s CSA share. I saw these- and without a clue what to do w. them- looked up a recipe on Epicurious. It said that “Japanese turnips are at their most delicious when simply cooked with their greens”- so I took their word for it. This miso butter is so crazy good- I encourage you to put it on any vegetable on hand- or I think it would work on tofu or fish too. Stir together miso and 2 tablespoon butter. Throw out turnip stems. 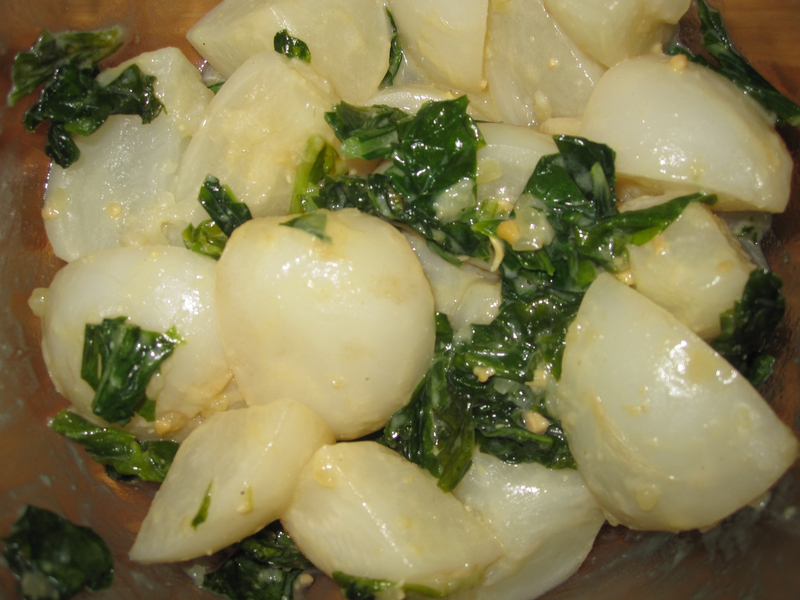 Chop turnips and leaves. Put in heavy 12-inch skillet w. water, wine, remaining tablespoon butter, and 1/8 tsp. salt. Bring to boil over med-high heat, then cover for 10 mins. Add greens gradually, turning and coating as volume reduces. Cover and cook another minute. Uncover and continue to boil, stir occasionally, until turnips tender and liquid reduced to a glaze- about 5 mins [mine took only a minute or two]. Stir in miso butter and cook one more minute.